Happy Friday Polished World! How are you today? Have you entered my Incoco Nail Polish Applique giveaway yet? 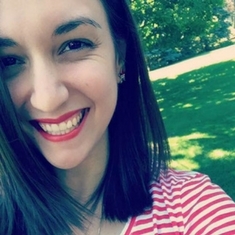 If you haven't, after you read this post, make sure to! Since St. Patrick's Day is less than two weeks away and the blog is all decked out for the day, it is only appropriate to share my nail art wheel for the holiday! After I created one for Valentine's Day, I had told myself I wasn't going to do a St. Patrick's Day themed one and was going to move on to planning an Easter wheel. Well one night on Twitter, Kristin from The Manicured Monkey sent me a tweet asking if I was going to do one. After we talked for a bit, I was inspired to create one and got to work! I'm super proud of this wheel! Many of the designs are my own, and I think 3 or 4 of them are inspired by other bloggers. Two of the nails were inspired by Sarah from Chalkboard Nails. 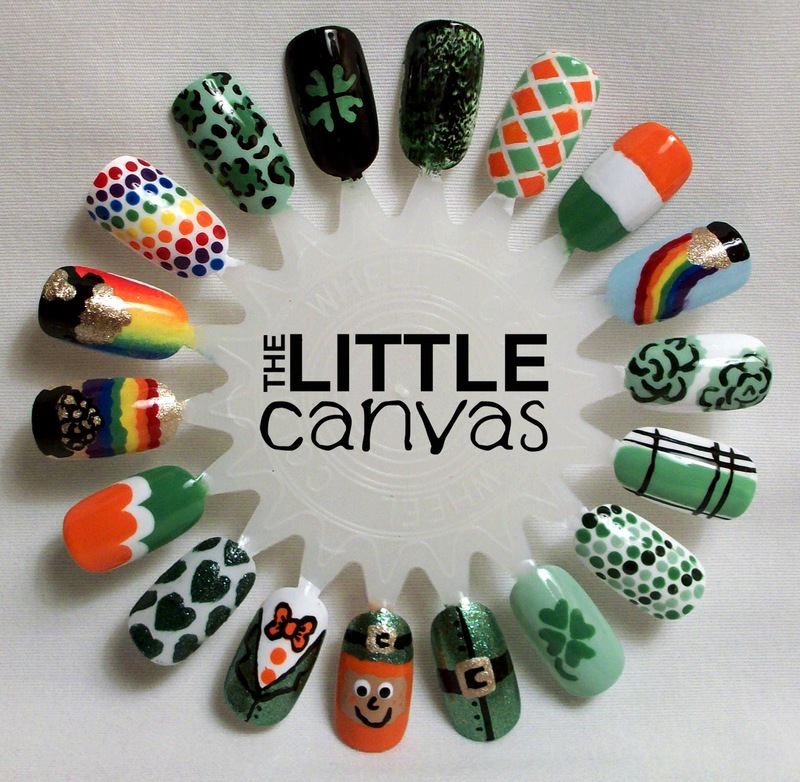 The first of those two nails is the black one with the green clover in the middle. It was inspired by her watercolor clover mani she did last year that was beyond amazing. Her nails look so much better than what I did on the wheel. The second nail inspired by Sarah is the black grunge looking one next to it. I followed her distressed tutorial using green polishes, and well I went a little too heavy on the black. Then to the left of that we have the leopard clover print nail which was inspired by iDreamOfLacquer, but I'll talk about that nail more in the rest of this post! Keep reading if you want to see which are my favorites from the wheel! 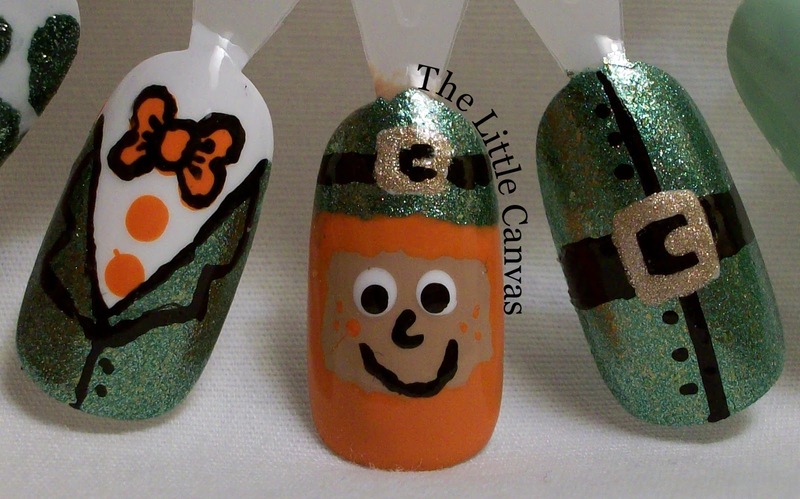 The first nails I"m going to highlight are my leprechaun nails! I couldn't pick just one because I really loved all three of them! Last year and the year before that, I did the little leprechaun faces on my nails, and I'll probably do it again this year because look how cute the little guy is! Instead of doing a neon hat like last year, I decided to go for a metallic green like I did when I first started blogging. I used Zoya Rikki which is really the world's most perfect St. Patrick's Day green with the gold shimmer flecks in it! I then created two little leprechaun suits. The first was similar to my fancy schmancy men with added detail like a real suit. I did a little orange bow-tie and decided to outline it to make it really pop. Then the other suit was similar to the Santa suit I did on my Christmas Wheel. 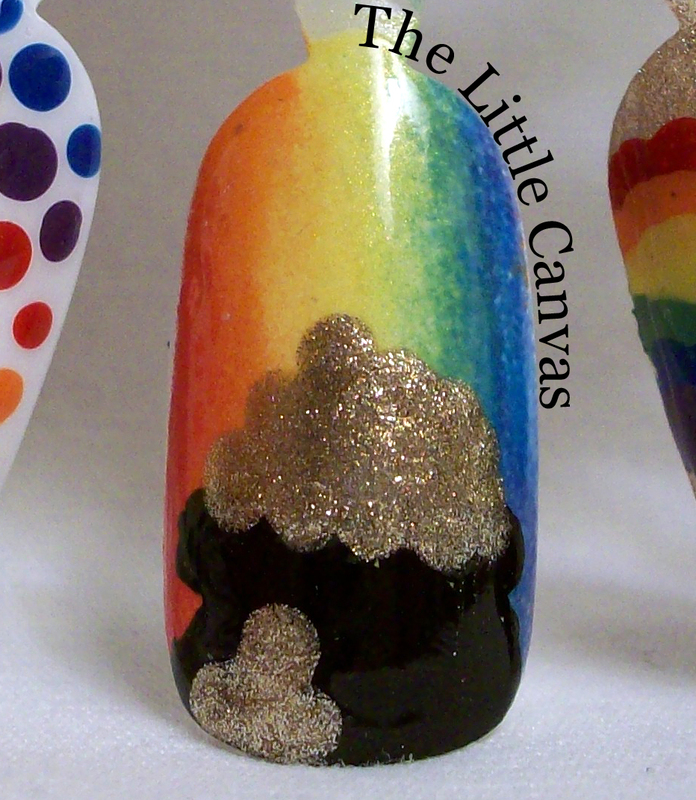 My next favorite nail is my rainbow pot of gold nail! This nail was originally done last year on my thumb as part of my St. Patrick's Day Kitchen Sink mani. I honestly love this nail so so so SO much and really fell in love with it last year. I started off with a base of white polish, then did a rainbow gradient by painting a rainbow on a make up sponge and dabbing it on the nail. When it was dry, I used my black Orly Instant Artist to create the pot of gold. I then used OPI Love Angel Music Baby to create the gold. Last year I think I added some gold glitter to the top and I'm kind of regretting I didn't do that here. Maybe I'll have to do it on my actual nail! The next nail I am highlighting is this pretty floral nail. You know how every year on St. Patrick's Day you can find those mint green carnations? The pretty white flowers with the mint petals that are darker green around the edges? Well, I wanted to try to create that on my nail! Sure, it kind of looks like a green rose, but we will call it a carnation. 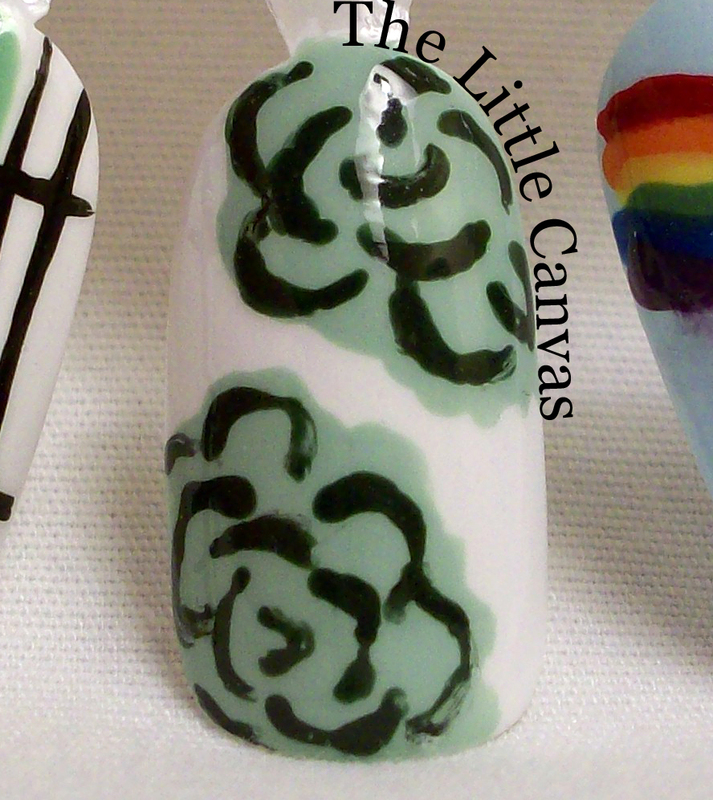 I started with a base of white polish, then used Sally Hansen Mint Sorbet to create the flower base. Then with Zoya Hunter, I added the little petals. 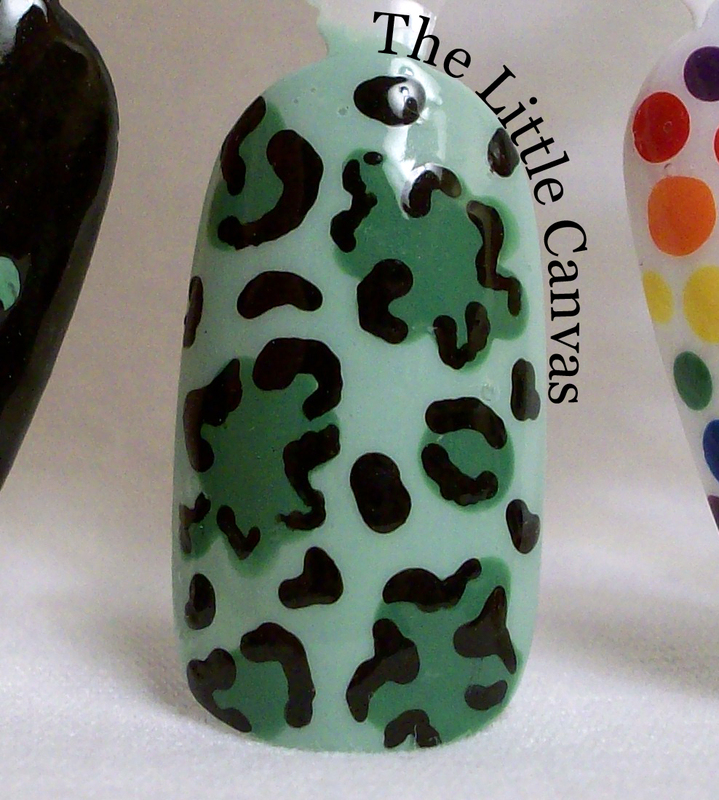 Last but not least, we have the leopard cheetah print which was inspired by iDreamofLacquer. Last year when she created this design, I fell in love with it. It was just so unique! I ran out of time last year to attempt it on my own nail, so I was super happy to re-create it on my wheel. I used a base of Mint Sorbet, then Zoya Josie for the spots, and outlined using my Orly Instant Artist. I think this is a design I might have to attempt on my actual nails as well! What do you think? Which is your favorite nail? If you are inspired by any of these designs, please, oh please, share with me! I'm going to create a hashtag soon where all of you can attach to your nail photos which have been inspired by something I have done. I want to highlight your nails and I think this will be the best way to do so! Stay tuned for that!